Many people I know (including members of my family) feel exercise is a time-consuming, unpleasant chore, and they dread it. The need to change into other clothes, to frequently take a block of time out of busy lives, and to get dirty and fatigued: they find it all unappealing. But I've always enjoyed the hard work and even the satisfaction of earning the next day's sore muscles. And I indulged myself with a slight sense of pride in knowing not only that I was helping the biological machinery that promotes health but also that I got a nice side benefit of being able to eat cookies because I'd burned extra calories. Wrong. Or, at least, not entirely right. As science shows over and over again, our intuitive notions about how things work often don't stand up in the face of data and careful analysis. The benefits of exercise are a case in point. 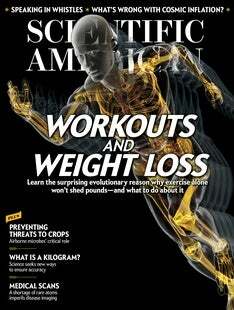 In this issue's cover story, “The Exercise Paradox,” anthropologist Herman Pontzer describes a surprising and fascinating result of evolution: humans burn about the same number of calories regardless of activity level. And compared with other animals, we use a lot of calories. In addition to overturning our commonsense notions, the findings provide further insights about why our kind has been so extraordinarily successful, becoming the dominant force on the planet. By the way, to be clear, we should all exercise. Regular activity does help our inner engines run right, and it has some nifty perks in elevating mood and improving cognition. But enabling weight loss regardless of diet? Not so much. The knowledge that we have had the capability to rule over our own world has inspired the idea that we would someday also come to live on other planets. To be sure, that knowledge encompasses healthy amounts of romanticism, a sense of adventure and even concerns about having sufficient options to ensure our species' long-term survival. Unfortunately, the “easy” problems of longer space journeys include such seeming trivialities as escaping Earth's gravity with rockets, building airtight ships with enough air to breathe, and carrying huge amounts food and water. A much harder challenge is one that Hollywood never told you about: the perils to the brain from cosmic radiation, which neuroscientist Charles L. Limoli describes in “Deep-Space Deal Breaker.” Will it prove to be the barrier to our conquering “the final frontier”? One thing is certain: our innate human ambition and ingenuity mean we won't stop trying.